You can associate blog posts, calls-to-action, emails, landing pages, social posts, website pages, and workflows with a HubSpot campaign on the campaign details page, or from their respective tools. Please note: once tracking URLs for paid search campaigns and other sources are created, they cannot be associated with a HubSpot campaign. Learn more about associating campaigns when creating tracking URLs. Hover over a blog post, email, or page and click Edit. 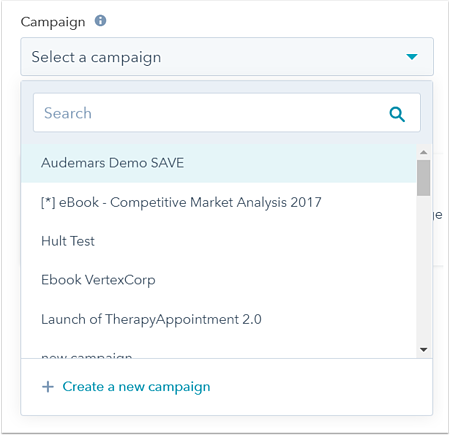 Click the Campaign dropdown menu and select a campaign to associate the content with. In the upper right, click Update to publish your changes. Click the name of the sent email. In the upper right, click the Actions dropdown menu and select Select campaign. In the dialog box, click the Select campaign dropdown menu and select a campaign, then click Save. Sent, opened, and clicks metrics will display on the campaign details page. Traffic to your website from a link clicked in the email will not be associated with the new campaign, and will not appear on the campaign details page or in campaign analytics. Such traffic will remain associated with the original campaign (or no campaign, if one wasn't selected) based on the tracking parameters automatically added to the link URL when the email was sent. In the bottom left of the right pane, click Next. 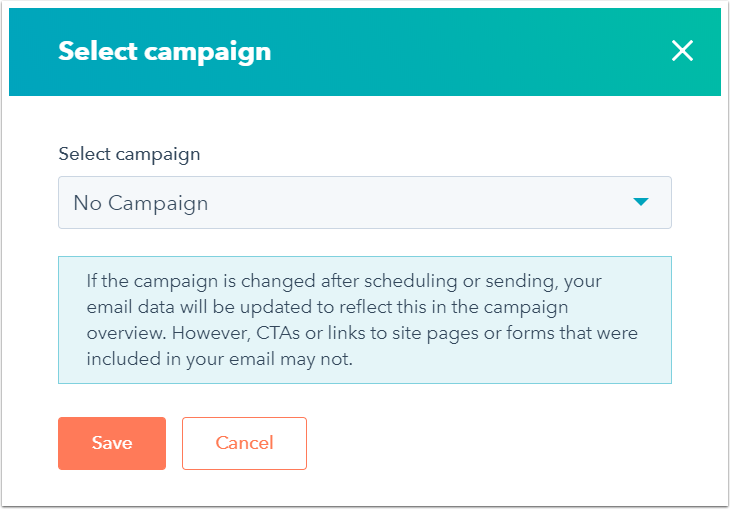 Click the Link a HubSpot campaign dropdown menu and select a campaign. In the bottom left, click Save, then click Finish. Next to Campaign, click Add or Edit. In the dialog box, click the dropdown menu and select a campaign, then click Save. 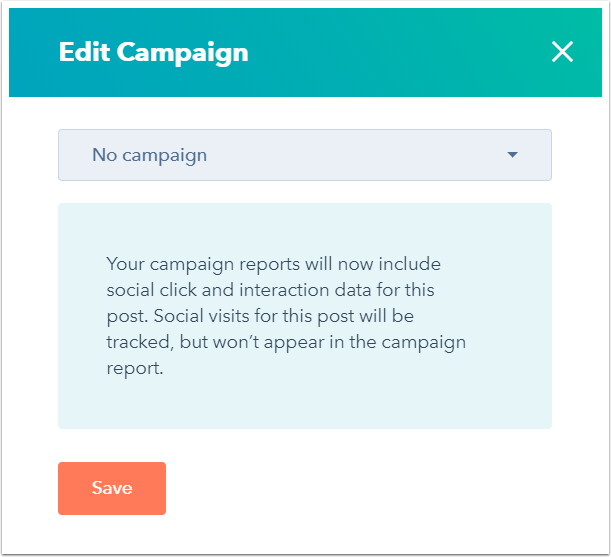 When you add or change the campaign of a published social post, traffic to your website from a link clicked in the social post will not be associated with the new campaign, and will not appear on the campaign details page or in campaign analytics. Such traffic will remain associated with the original campaign (or no campaign, if one wasn't selected) based on the tracking parameters automatically added to the link URL when the social post was published. In the left sidebar menu, navigate to Scheduled or Draft. In the bottom right of the right pane, click the Campaign dropdown menu and select a campaign. In the bottom left of the right pane, click Update scheduled post, Publish post now, or Update draft. Workflows can be associated with one or more campaigns. Hover over a workflow and click Edit. Click the Campaigns associated with dropdown menu and select one or more campaign(s). To remove a campaign's association with the workflow, click the X to the right of the campaign.